poodle « Oh My Blog! Honey, my golden doodle, has to wear snow boots now. So the winter isn’t just taking a toll on us, it’s causing injuries to our pets as well. 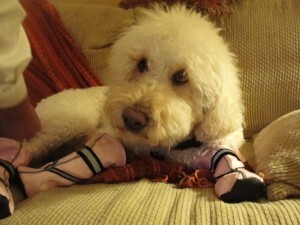 Honey, our golden doodle, hurt her paw somehow so now she has to wear boots when she goes out. Let me tell you just how much fun that is, every time she wants to go out I have to Velcro 4 boots on her. She’s so funny to watch once she goes out. She thinks she can step out of them. It’s hysterical! Honey hurt her paw so now she has to wear boots in the snow. She is not a happy camper.